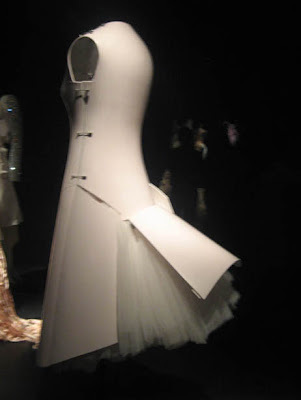 I finally made it over to the Metropolitan Museum of Art this past weekend and checked out the exhibit at the Costume Institute; blog.mode:addressing fashion. 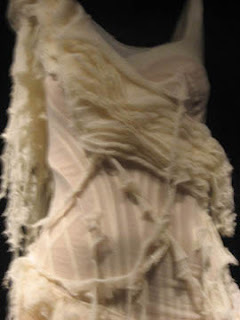 When I first heard about it, I must admit that I wasn't too blown off my feet, but then a friend told me that the McQueen shipwreck dress was in the show, so I had to go and see it in person. I'm going to be honest, I didn't think it was that great. I thought the concept was interesting, but I don't think it was enough or it was executed as best as it could. The clothes didn't seem to have a unifying thread, like they were chosen haphazardly. If the purpose of the exhibit is to foment critique and conversation, perhaps having the same "blog bar" at a regular exhibit would've been more successful. Although it's supposed to be the "the first in a series", so perhaps later shows will utilize this to same effect. It would've also been nice to see (semi)real-time comments next to the clothes as you walked around. This is probably wishful thinking, as I imagine it would be very expensive, but just imagine how much it would benefit people to read both the designer's opinion as well as what the people are saying while looking at the garments themselves. That being said, if you haven't gone you should definitely rush over there before it closes on April 13, as there are plenty of things that need to be seen up close and personal to really be appreciated. 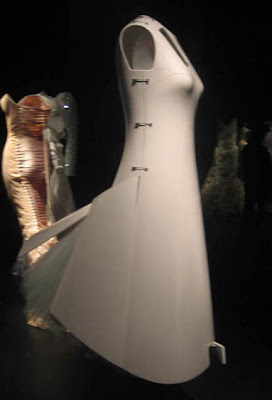 I was SO excited to see pieces by Hussein Chalayan in the exhibit. 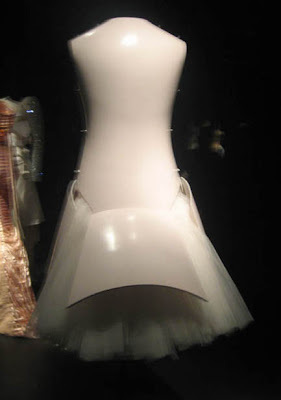 Apart from this remote-control dress, they also had the wooden corset. It's so beautiful in action and I just stood there mesmerized watching it go round and round. 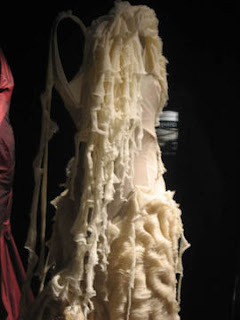 It's the clothes of the future and then you see them in real life and you don't quite know what to think. 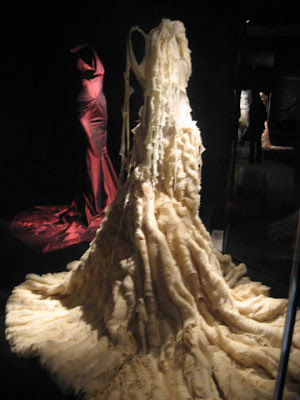 Of course the piece-de-resistance is the shipwreck dress by Alexander McQueen. It truly is even more beautiful in person. 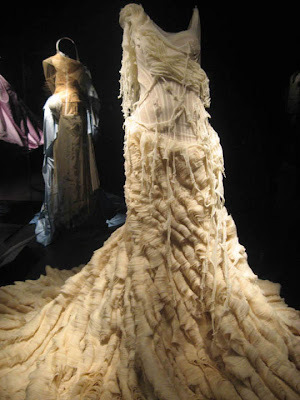 My eyes could not believe the laters of ruffles upon ruffles that make up the dress. And then I tried to figure out the process of making a pattern for it and my head just about exploded. 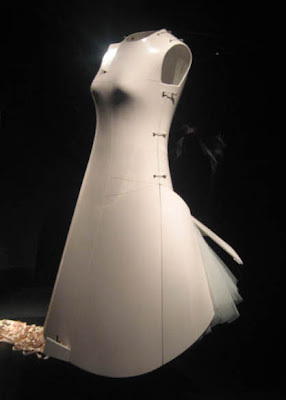 If anyone ever doubted McQueen's genius, this should be enough to prove them wrong. 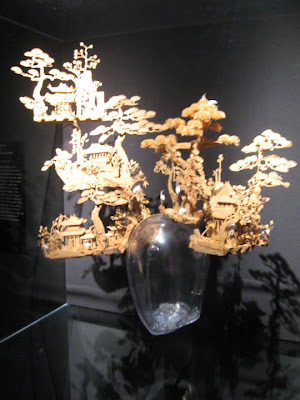 This Philip Treacy hat was a total surprise and I loved it. 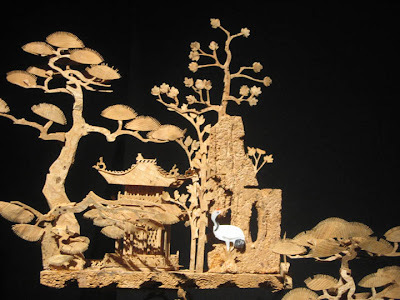 I included the close up detail because it proves just how amazing and intricate his work is. I'm sure if I showed that image to people and made them guess what it was, they would never guess "a hat", and much les when they realize the scale. I hope one day I get to rock one of his hats, I truly do. I was very surprised to see that Miguel Adrover was included in the show. Remember Miguel Adrover? He was kind of cocky and his work a little conceptual at times, but he was definitely very smart and had a particular aesthetic. I wonder what he's doing now. I'm gonna go into spy-mode after I finish writing this and see what I can find. 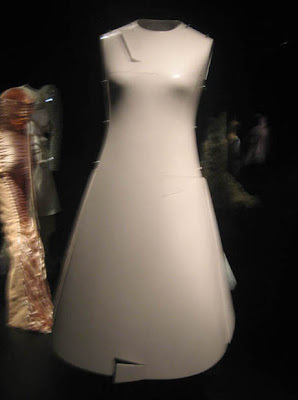 To me one of the best things of the collection was seeing pieces by Tao and Rodarte included. Because it means that there are still many golden ages of fashion to come, and when that spirit seems to be dwindling in so many other industries, it's a welcome respite from saying "back in my day" or "when I was a kid, things were different" too much. 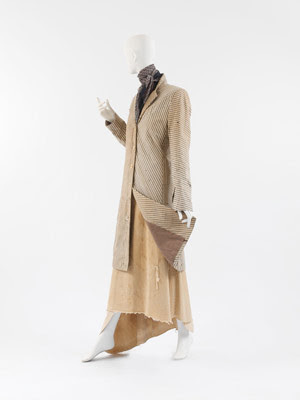 blog.mode:addressing fashion closes on April 13 2008. For more information visit their blog.